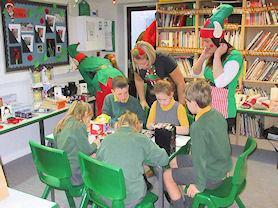 FOSS once again organised this very popular fundraiser and transformed the Resources classroom into an Elf Workshop. The children were able to buy, wrap and label a gift for a loved one at Christmas which meant that their family were able to receive a special gift chosen by the child to open on Christmas Day. The children loved choosing the gift, thinking about the reasons for the gift, and were able to enjoy the magical Christmas experience during the school day. Thank you to our FOSS parents for their hard work.